Zealand is surrounded by salty sea water, and you can experience exciting coastal fishing on the entire 2,000 kilometer long coastline along Zealand and the islands. Here you will find flatfish like flounder and plaice but also cod – and in the course of the summer months you can also catch garfish, mullet and mackerel. But it is primarily the sea trout that lures sport fishermen from Zealand to the coast. And it is easy to understand why it was the Zealanders who were the first to cultivate Danish coastal fishing for sea trout. Even today people still recall that the spots at the end of the Isefjord and the rough and windy locations on the north coast of Zealand were where coastal flyfishing was developed. Zealand not only has some of the country’s best sea trout fjords – Isefjord, Lammefjord, Roskilde Fjord and Kalundborg Fjord – but also a particularly varied and versatile coastline. Here you find more or less everything your heart could desire in the way of fishing locations – everything from Møn’s massive chalk cliffs and the rugged salt worn rocky beaches of the northern coast, to Lolland and Falster’s sheltered brackish waters and the seaweed ridden waters of western Zealand. And no matter what time of year, or what the wind and weather bring, there are always places to fish with a chance of landing some of the precious silver of the sea. 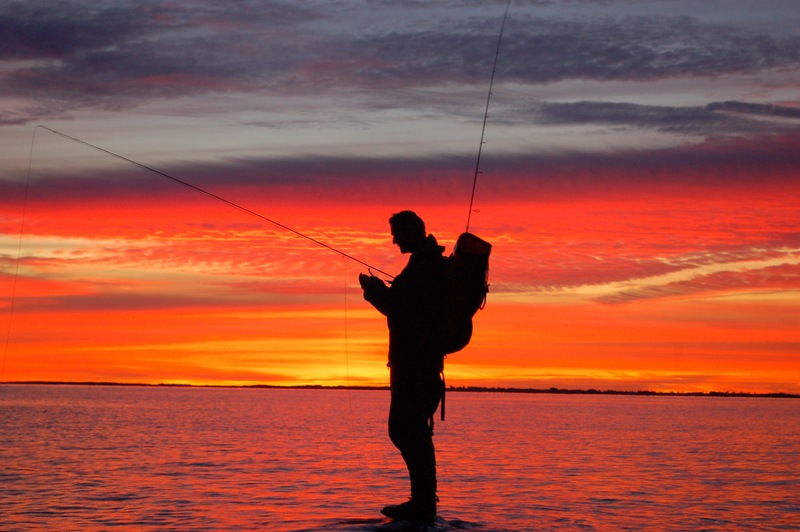 You can fish along the coasts of Zealand year round, but the type of fishing changes in the course of the year. Typically we speak of spring, summer, fall and winter fishing, and if we are to talk about peak seasons, it would be from March to May and again from August to October. Winter fishing in December, January and February is characterized as a rule by frost and low water temperatures, which means that the sea trout don’t hunt to the same degree as at other times. These fish can also have problems digesting larger food specimens, and thus it often pays to scale down the size of your lures and to fish, for example, with very small spoons and flies. Small amphipod imitations, lures with provocative colors like pink and chartreuse as well as compact wobblers are particularly good choices during these winter months. Otherwise it is a matter of finding the spots where the water is the warmest, relatively speaking, and the least salty. This could be brackish waters, the inner fjords and dark-bottomed shallow spots that are particularly good at absorbing the scarce warmth coming from the sunlight. A rise in temperature and mild weather can be just the thing that gets the fish to liven up, but otherwise you just have to keep at it. Fishing in the winter can be difficult, but with a little luck you can come across groups of smaller fish or one of the big sexually mature fish that decide to skip spawning and remain all silver and chrome. 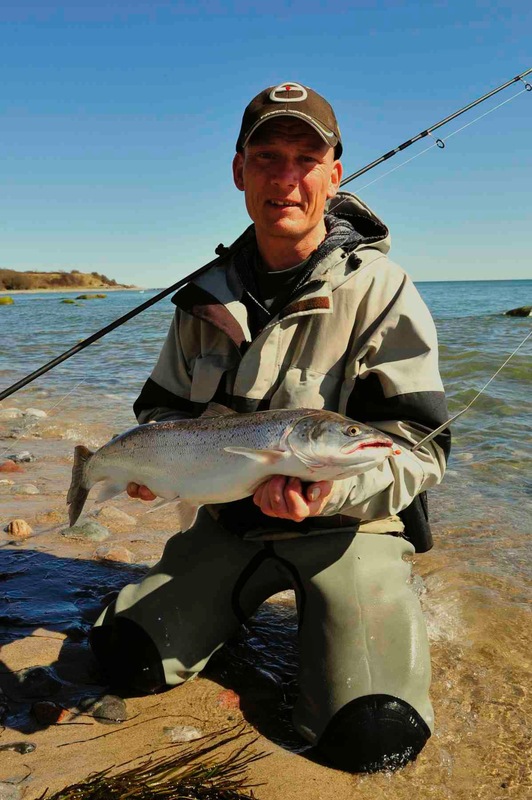 Fishing in the springtime can be pretty hectic, since the rising temperature causes the sea trout to start some serious feeding. They are ravenously hungry after a long winter and can be lured to take whatever you offer them. Days with lots of sunshine and rising temperatures are particularly good for fishing, and on both the open coast and in the fjords you can now find schools of fish searching for food all the way into the shallow waters. This time of year it is particularly good to fish in bays, inlets, the inner fjords and in spots close to river outlets, but as the warm weather increases, the fish spread out along the open coasts where they are particularly attracted to long reefs, areas with lots of seaweed and mussel beds where there is lots of food to be found. The summer months can be good for fishing for sea trout, but there are some things you need to keep in mind. 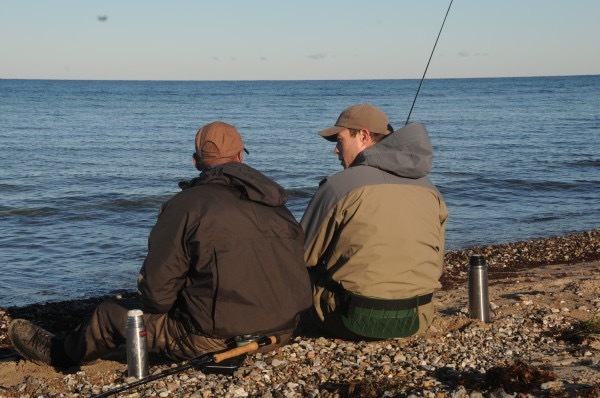 The water temperatures begin to reach levels that make the sea trout seek out deeper waters in the daytime, and unless you have access to locations with good depth and currents, you are better off fishing at dusk or dawn and during the night when the sea trout come into more shallow water to hunt. This time of year there are lots of different kinds of food, and sea trout can be lured to hit on a number of different spoons, wobblers and flies. But they can also be quite selective, so it is always a good idea to keep an eye on the water. For example, if there are lots of sand eels and gobies, then there is a good chance that the sea trout are especially fond of precisely these prey items. 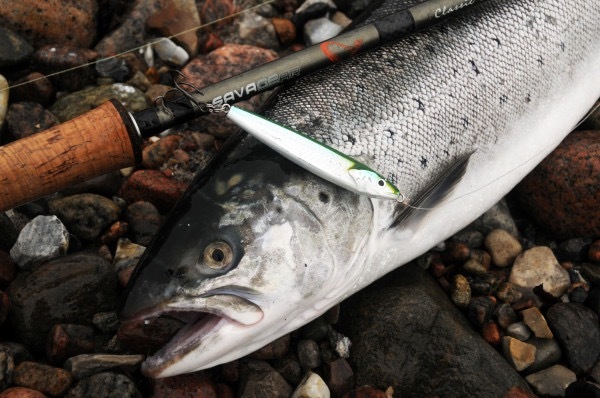 The fall months comprise a transition period for fishing for sea trout. During this time you will encounter small fish, big chrome fish and colored migratory fish along the coast. This time of year you can fish all day long since the water temperatures are again at an optimal level, and here in particular it is good to fish in the fjords. This is also true of locations close to spawning river outlets, since the sea trout often gather here in small schools. Bear in mind, though, that finding a school of fish at this time of year is not the same as catching them. As the sea trout gradually take on color, they also lose their immediate instinct to strike. Thus, the key to catching a fish can be using lures with loud colors that can provoke a strike. Try, for example, orange/yellow or pink spoons, a ragingly florescent fly or a noisy spinner. For a coastal flyfisherman a 9’ #6/7 fly rod, a floating or intermediate WF fly line, 100 meter backing and a 4-meter long leader with a 0.25mm fluorocarbon point is a good choice. Some of the most popular flies on Zealand are the Pattegrisen, Grå Frede (Grey Frodo), Kobberbassen (The Copper Bully), Juletræet (The Christmas Tree), Cutthroat Kutling (Cutthroat Gobius), Aura Rejen (The Aura Shrimp), Glimmerrejen (The Glitter Shrimp), STF Baitfish, Honey Shrimp, Flatwing Tobis, Fyggi and Brenda. 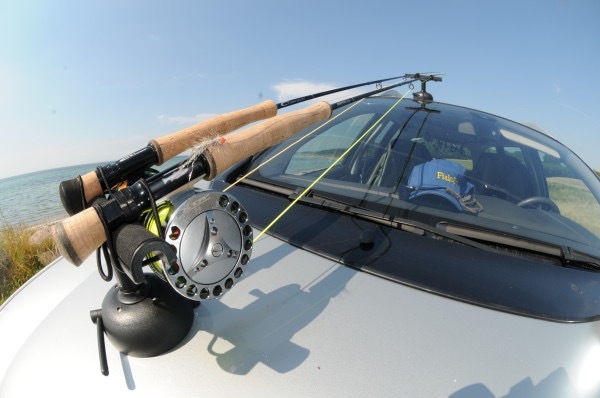 If you are spin fishing you could choose an 8-9’ spinning rod with a casting weight of 15-20 gram or a 10-11’ bombarda rod with a corresponding casting weight, along with a solid spinning reel with plenty of new 0.15-0.20 mm braided line. Far reaching lures like Snurrebassen, Sølvpilen (The Silver Arrow), Stripperen, Sømmet (the Nail), Herring Inline and Gladsax woblers are just some of the lures that Zealand’s sport fishermen have adopted and used to catch fish along the open coastline. During the summer season you can run across a number of interesting visitors from the south. The garfish are the first to arrive, and they come in large numbers from the beginning of May to the end of June. Here you will encounter hectic fishing on the open coastal stretches with scattered belts of seaweed and seagrass. Here it is good to use small pieces of herring as bait or small spoons and flies. From the end of May and on toward September you can also find mullets along the coasts. They can be both difficult to spot and to catch, but they are relentless fighters and present an exciting challenge for even the most experienced fisherman. Mullets are found very close to land where they feed on fresh algae and the weeds growing on rocks. Some of the places you are most certain to find mullets are around piles of rocks, stone piers and in harbors and marinas. You can catch them with small green flies, but fishing with bread seems to be the most successful method. The mackerels come to Zealand at the end of July, and in August in particular you can experience excellent fishing for mackerel. If you want to have success with mackerels, you need to find spots with a good depth. If we disregard the big harbor areas, places like Røsnæs, Asnæs, Sjællands Odde, Nakke Hage and the Helsingør isthmus are worth investigating. Mackerels are more or less omnivorous, but shiny silver spoons and small attractor flies are good for enticing them to bite.